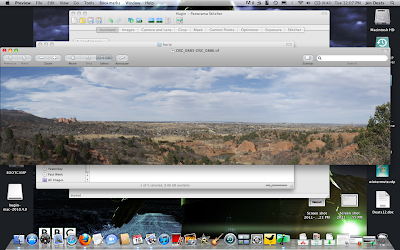 There are several ways of making panoramas without fancy equipment. 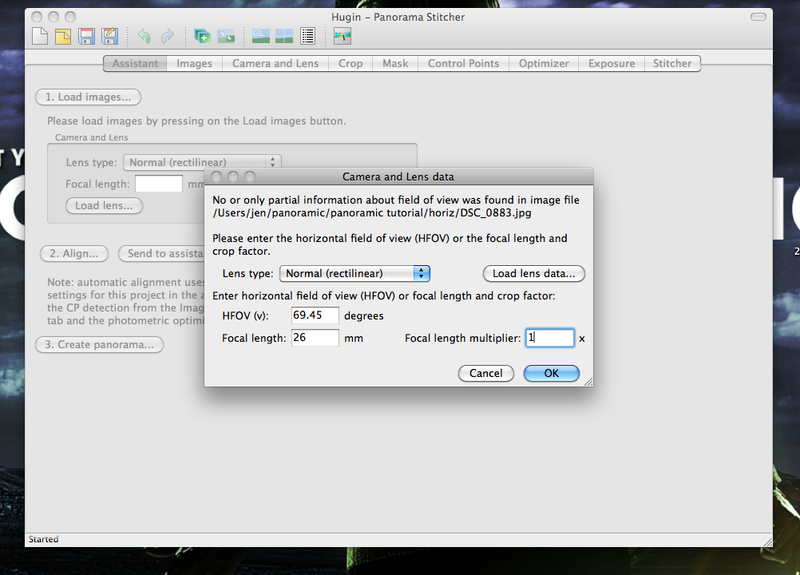 First, I would check your camera and make sure you don't already have a panoramic program option on there. A lot of cameras have a panoramic setting where, if you take several photos in succession within the program, it will stitch them together for you in-camera. Even if you don't have an in-camera program, you can create panoramas with any camera using free software. There is a free demo of Autostitch available for Windows, which I what I used to make my panoramas. 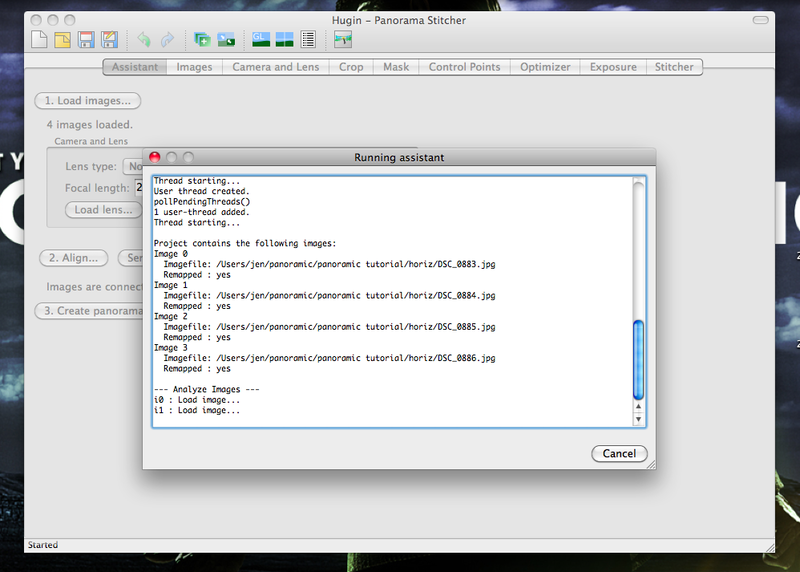 Unfortunately, it doesn't work on a Mac unless you are running Parallels. Boo. They do have an app for iPhone if you usually take pictures on your phone. 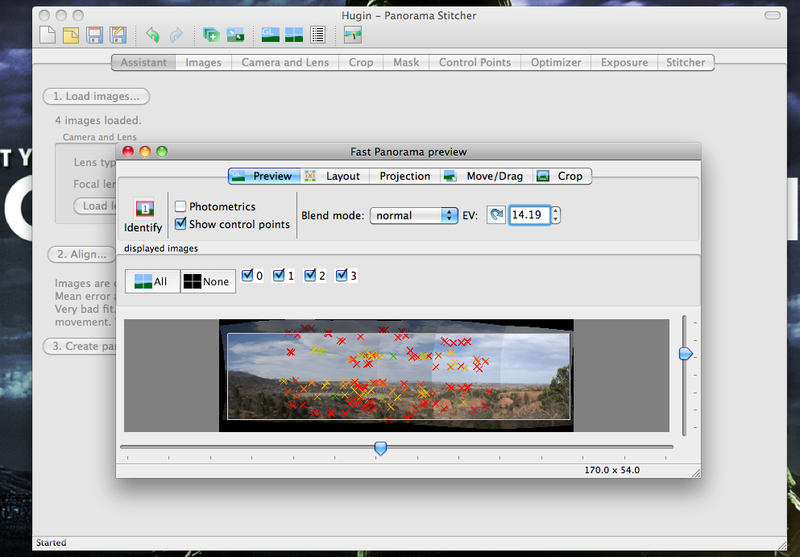 I had heard good things about Hugin, also free software, but works on all platforms, so I used that for this tutorial. Before we get to that, I have some excellent articles on panoramic technique for you. 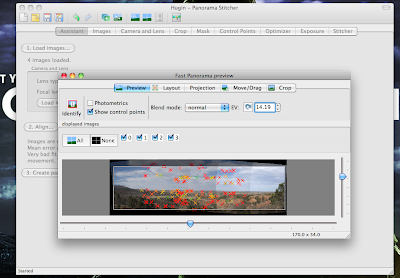 This short course in panoramic photography is extremely helpful. Just remember that stitching programs will fix small mistakes in exposure at the stitching points (but you should use exposure lock if you want perfect panoramas) and cropping will fix any leveling errors (not everyone wants to hike up a mountain with a big tripod strapped to their back, I did all my photos freehand). 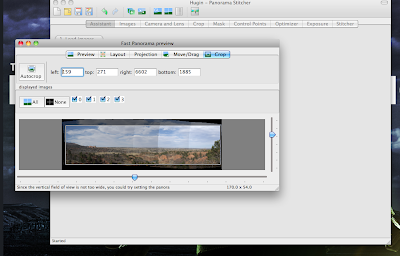 Here's another helpful article on panoramic photography. 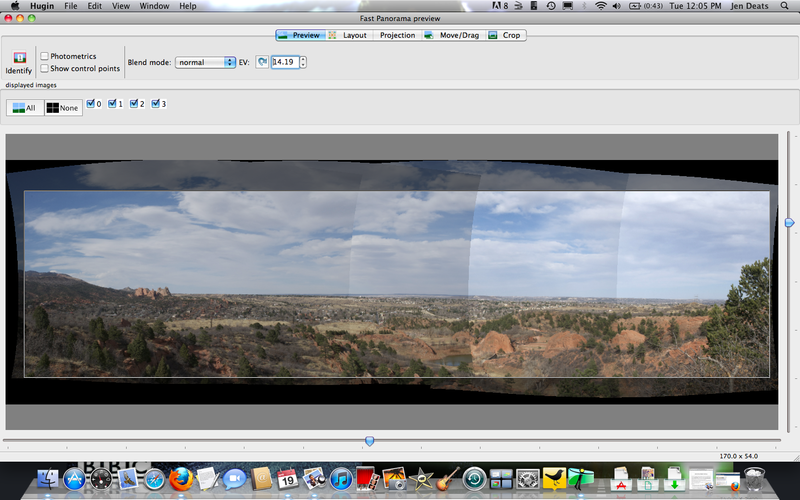 Lifehacker also did a tutorial on creating panoramic images using Hugin. These articles are all supremely helpful for the little details and advanced techniques. I thought, for the purposes of this tutorial, I would give a simple step-by-step and show how to use the software to create basic horizontal and vertical panoramas (because often tutorials give too much information). Then, you can go experiment on your own if you wish. Just go with the default settings for now, you can always experiment later. The lens type can actually be changed later on in the process, but I change mine to Equirectangular. 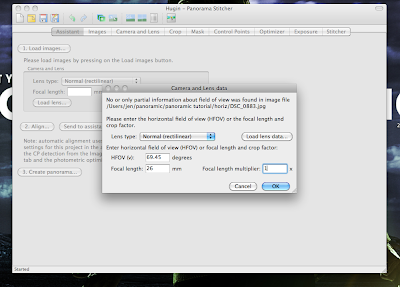 I just used a focal length multiplier of 1x. 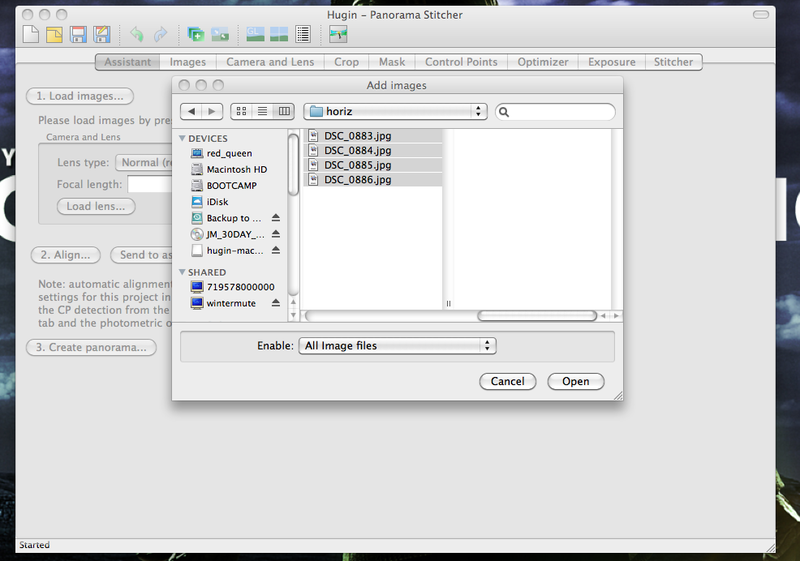 Once images are loaded, click align to have the program automatically detect the stitching points. Go have a cup of coffee. 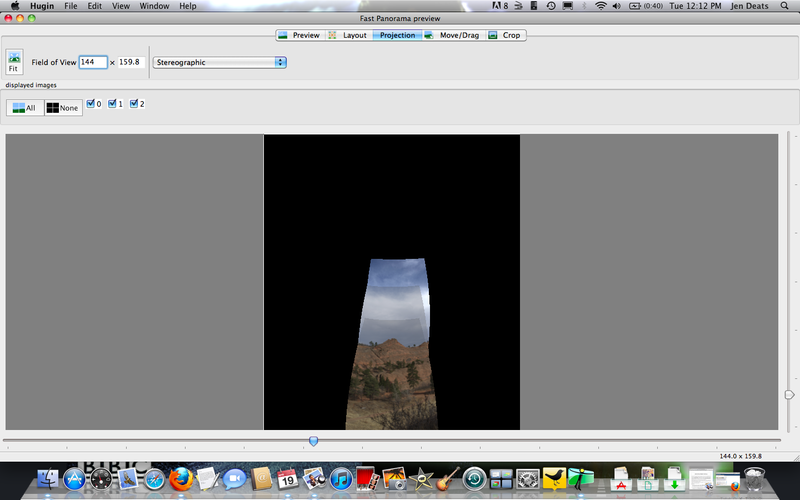 Depending on how many photos you have, aligning might take a while. 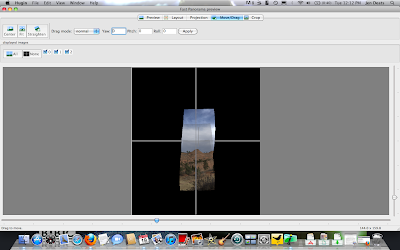 Once you have aligned the photos, the preview screen pops up and you can make changes to the various settings. Don't worry if you can see the lines between the photos. Those will go away. Click over to Layout and make sure the control points make sense (i.e. the photos are lining up correctly). 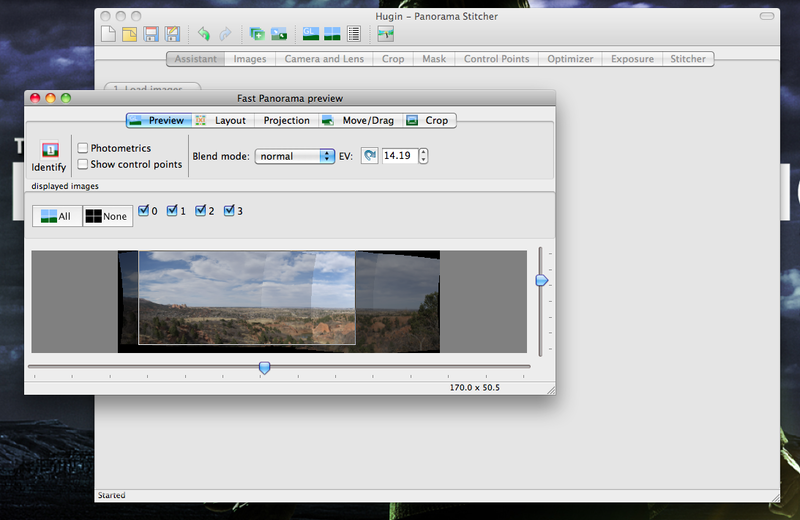 Try cycling through the options on the projection menu to make the photo look the most correct. Make sure to save your project before doing this because going through all the project options crashed the program for me once. Equirectangular seemed to work best for me. I have skewed the photo in the Move/Drag menu to illustrate what it does. This photo did not need to be moved, but I had to use this option below in the vertical tutorial. If you are interested, the program will show you where all the control points are by checking the box in the preview menu. You can also maximize the preview screen to make editing the photo easier. 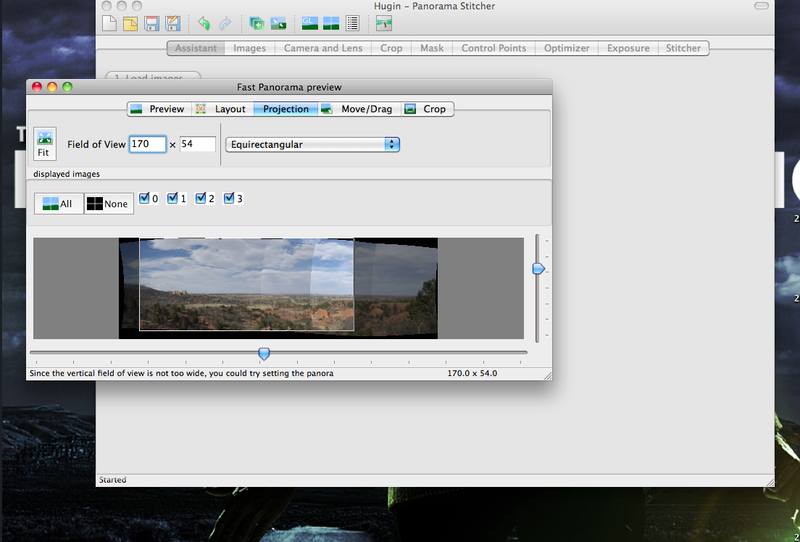 Minimize or close the preview and click Create Panorama. Choose where to save the finished photo. 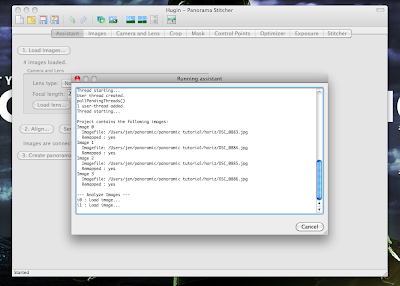 Once it is done, you can open it up and see your newly-created panorama! Make sure to save your work file in Hugein as well, so you can make changes later if you wish. 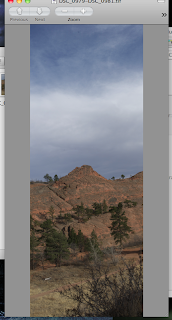 For a vertical panorama, there are a few different steps. Complete the same steps above until we get to the Projection option. I experimented a bit, and the Stereographic setting seems to work best for vertical panoramas. Then, use Move/Drag to correct any distortion. You just click on the photo and drag it upwards to adjust where the center point of the panorama is. Use Crop to adjust out the black areas. And you have your own vertical panorama! 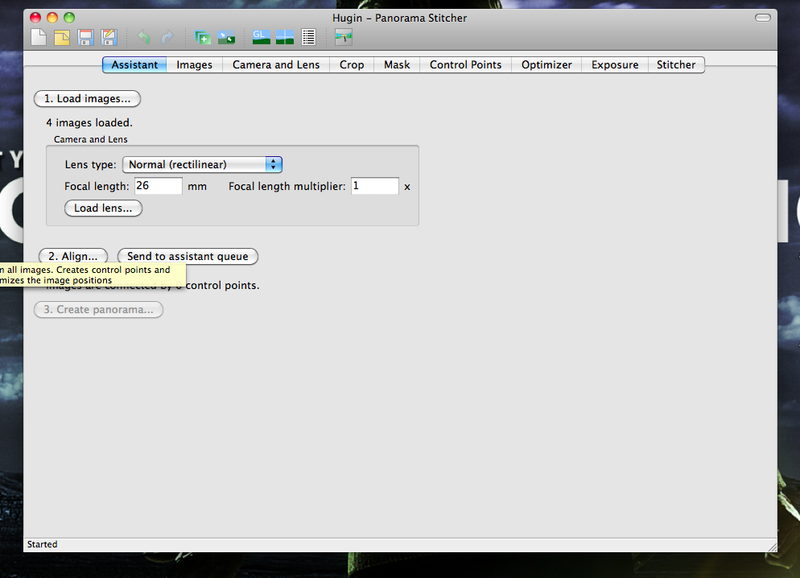 Autostitch is more user-friendly and less complicated, but Hugin gives you more customizable options. 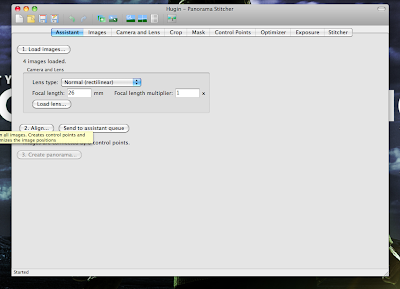 Hugin takes longer to stitch photos together (due to larger size of photos, which you can change). 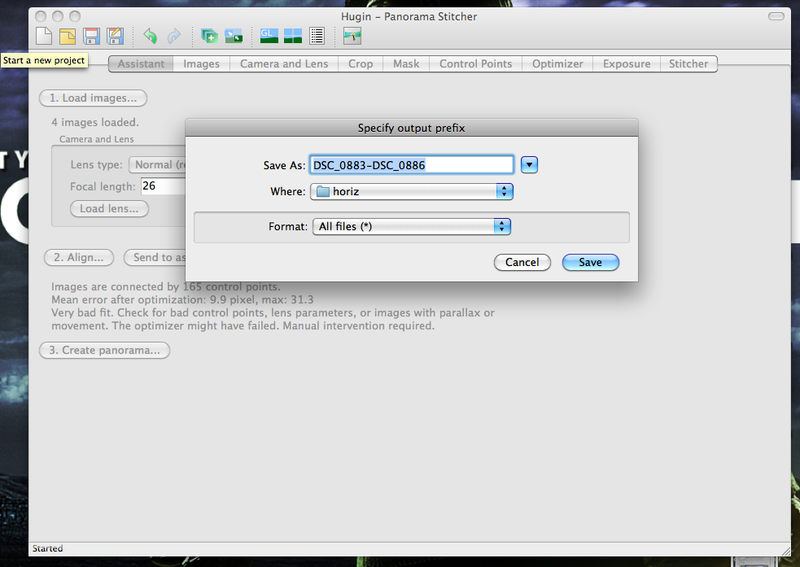 Autostitch does not let you crop photos in the program, you need a photo editor to do the cropping. 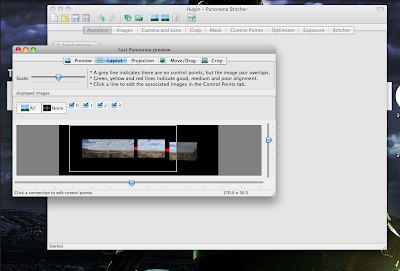 Hugin incorporates custom cropping and other options into the panorama creation. 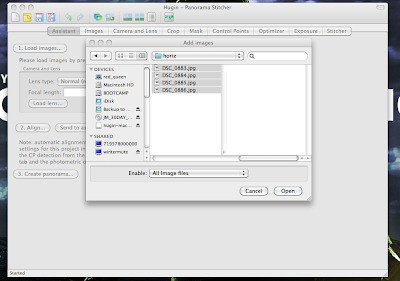 Hugin has a shinier user interface. 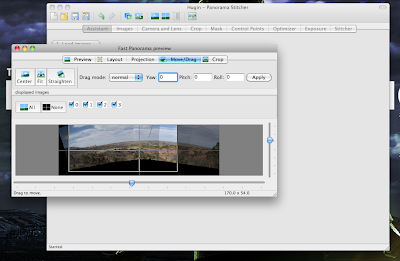 Hugin works on Windows, Mac & Linux, whereas Autostitch only works on Windows. Autostitch is a demo, whereas Hugin gives you the full program with no limitations. 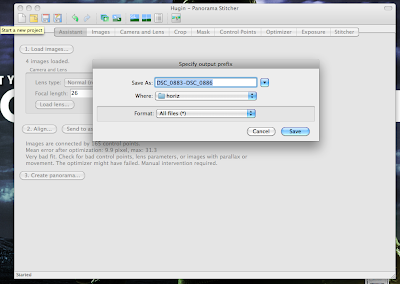 Hugin lets you save the panoramas to go in and make changes later within the program. Great tutorial. I really love the vertical panorama!